There’s no shortage of comedy clubs in NYC… with so many to choose from this night, we decided to stop by Greenwich Village Comedy Club just one block south of the Comedy Cellar. This is perhaps the busiest street in the world to see stand up comedy with two Comedy Cellar, Comedy Cellar Village Underground, Grisly Pear, and Greenwich Village Comedy Club and the Village Lantern right around the corner there are just so many to choose from. We saw the lineup at Greenwich Village Comedy Club and it was a stellar lineup and need some laughs after a busy work week. We decided to chat with a few comics after the show and one of our favorites of the night was Luke Thayer. We interview him right after his set at a jam-packed sold out show and here is what he had to say. My first job ever was working at a video game store, kind of like GameStop. After that, I’ve worked loading docks, sorted US mail, a Bob Evans for 3 days, substitute teacher, and as a bank teller. The last day job I ever had was as a temp at an investment bank…and by “temp” I did that job for 5 years straight. I was never an employee, and I don’t even think it’s legal to do that, but New Yorkers do what they have to do to survive. Probably something in athletics. Maybe owning a gym…who am I kidding, WORKING at a gym. Maybe being a really low-level basketball coach. My favorite place is ANY place that has an audience excited for comedy. It could be to see me personally or just see a comedy show. I don’t care if it’s at one of the top clubs or a coffee shop. I just love performing for people who love the experience of live comedy. I mean who do we count as up-and-coming? That could be anyone less famous than Kevin Hart. Or it could mean someone who just started doing open mics a year ago. I can say this with all sincerity, I love comedy and there are so many fun acts to watch out there. I see comedians that make me stay in the room and watch just by whatever aura they have about them. If you want to see a comedian as they are on their way to being good and then great, then go to a local club and buy a ticket to see someone you’ve never heard of. If you go in with a mind to have a great time, I bet you 9 times out of 10 you will. Maybe a year or two after I left my last day job. I knew intellectually I was making my money solely with comedy, but I didn’t FEEL it until a year or two into that lifestyle. It varies on the week. Usually somewhere between 5-10 times a week. I have to do some trade-off in nights now because my wife, Abbi Crutchfield, is also a comedian and we alternate our schedules as best we can because we have a 1-year-old. Similar t my answer for #4… any club that treats the performers well and gets an excited audience. The Funny Bone chain does a really good job of providing that experience in all their clubs. And I’m always looking to find more clubs that really love comedy. I’m not one of those comics that goes to anger. I’m pretty good at this point at reading people and figuring out what type of “heckling” this is. Most times it’s someone that’s too enthusiastic. With that type of person, I try to use a little wit, and if that fails, I just tell them straightforward to stop talking. Very very rarely do I get the person that is speaking with malice. Those people, I dig in a little deeper. Keep pushing. Hang out more. Knock on doors. Make yourself known more. I’m a Midwestern guy at heart, and feel this sense of politeness and waiting my turn. Don’t worry about that at all! Take the risks. Moving through the world. So that means I’m talking about relationships, living situations, where I grew up, how I grew up, what people are like that I come in contact with every day. Life experiences basically. It almost never happens anymore that a crowd doesn’t laugh…at least for an entire set. It used to! But I’ve learned to be patient if a joke doesn’t land, to be ok with some silence, and how to win them over. Not all silence is equal. Some times they’re really intrigued and intensely listening and seeing what happens next. Also, if a crowd isn’t feeling me as a performer (which can some times happen), I’ve learned how to win them over, at least to some degree. Change gears. Talk to them more. Call the moment. Whatever it takes. If that doesn’t work, well then I guess we can all laugh in the back about how bad that went. 17. When can people see it? I’m assuming “it” is my comedy. 🙂 I perform constantly, often in New York, and often out around the country. If you want me to come to your town, request me at your local comedy club. If “it’ isn’t referring to my comedy, then just remember I went to public school so it’s very likely I missed the subtle cues I was supposed to catch. My debut album “Hopes + Dreams” is available and can be heard basically anywhere you download albums. I post jokes every day on Twitter @comedianluke and you can find my performance schedule at comedianluke.com. People can reach out to me on any social networking platform or through my website. 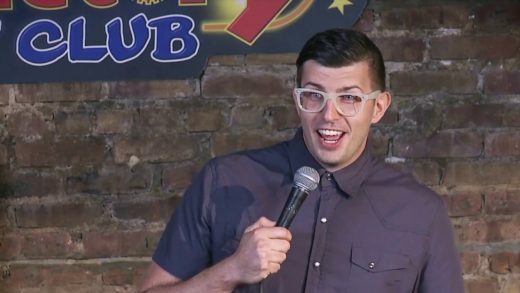 Thanks for reading this interview with the talented comedian Luke Thayer at the Greenwich Village Comedy Club. If you are looking for some great laughs there is no better place to find tickets. We have some of the best NYC Comedy Clubs on our site. We like to extend a fantastic discount of 20% off all shows.